This page contains the HWT style handwriting lessons 25 - 50 that are **more or less coordinated with the book, Teach Your Child to Read in 100 Easy Lessons. Uppercase letters are not being introduced or practiced as often as one might require. If this is the case, please visit HWT Handwriting Practice Worksheets K-1 to print uppercase letter practice. Lessons 33 & 34: Lesson 33 has a blank line. The student could write the words from lesson 33 on the forth line. Lessons 35 & 36: Both lessons have a blank line and a sentence. Lesson 36 contains "endings." You should decide if the student will write the endings again or add a consonant to each of the endings to form words, and then write the words. Lesson 35- g, f, See the dog run. Lesson 38 contains endings. Decide if the student will write the endings again or add a consonant to each of the endings to form words, and then write the words. Lesson 40 contains endings. Decide if the student will write the endings again or add a consonant to each of the endings to form words, and then write the words. Lesson 42- k, A rock is in **my sock. Please note that I used uppercase A and the letter y and, so far, neither letter has been introduced in these handwriting lessons. Because of this, I made the letters "solid" with direction arrows. **Additionally, the word my has not been covered by the reading lessons. 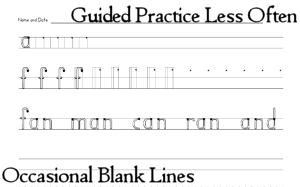 Lesson 44- o, k, f, and a blank line for the handwriting practice of your choice. Lesson 46- v, Endings: ot, og - The student should add a consonant in front of the last 3 endings to make a word. Lesson 47- sh, S, v, sentences: She is old. and She gave a fish.. Lesson 49- th, this, that, car, T, Th, That, That car is a hot rod. **Note: At some point in making these lessons, I began working toward complimenting the past and current reading lessons in the book by adding "endings" and words from the reading lessons to the handwriting practice.